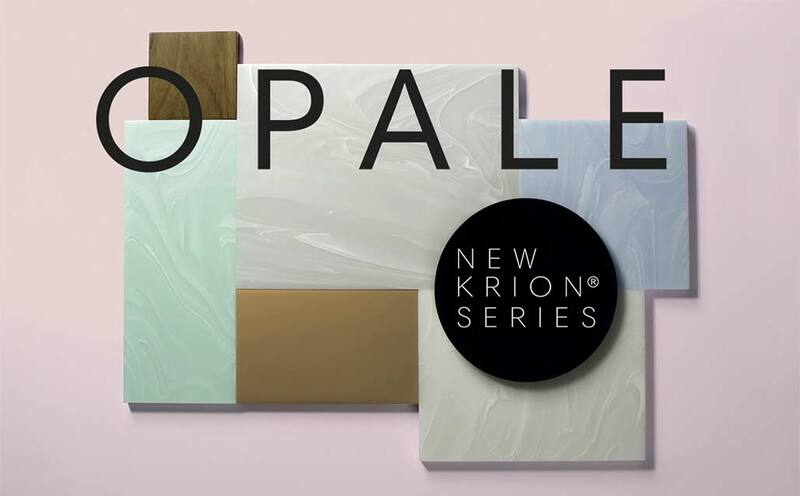 The new OPALE series by KRION comes from the convergence of light and movement. Coloured surfaces featuring irregular patterns traced throughout the body by gleaming, brilliant and profound veining that is reminiscent of flowing water. The result is unique and balanced textured sheets in shades of white, green, blue and grey that evoke the calm serenity of the ocean. The OPALE series can also be backlit, whereby the material allows a degree of light to filter through, illuminating the texture and revealing new, previously hidden lines and shapes. The characteristic birefringent veining has become the hallmark of this series, enabling us to admire the intense, contrasting patterns that are in line with the latest decorative trends. The various finishes that can be applied to this material allow for a vitreous lustre or matt effect in a declaration of strength and inspiration that lends an air of luxury and exclusivity to KRION. White wavy lines on a white translucent background offering endless compositional possibilities. It is reminiscent of waves lapping gently on the seashore and a sky covered by dense clouds that trace a thousand shapes. It is suitable for use with backlighting, adding considerably to the possible uses. Available in 12 mm sheets. Curves and deep grooves on a greenish background that evokes the finest precious stones such as emeralds. Stately and majestic, backlighting brings out its potential to the full, offering myriad compositional options. Available in 12 mm sheets. A KRION colour featuring sinuous white lines on a light blue background that brings out the subtle hues to the full thanks to the backlighting option. Reminiscent of ocean waves, it evokes sensations of the sea at calm. Ideal for mixing and matching in numerous settings and décors. Available in 12 mm sheets. The subtle curves of this colour reflect the gentle silver ripples that form when the breeze stirs water to life. Whitish lines against a grey background that create a stunning effect when backlit, allowing for endless compositions and transmitting a sense of neutrality and serenity. Available in 12 mm sheets.